This quick post will show you two method to update the Openfiler appliance. On the previous post, i have describes in details on how to setup and configure Openfiler iSCSI Storage. 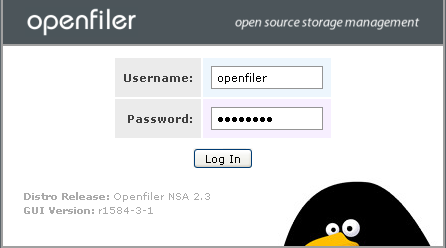 Openfiler is an Open Source Network Attached Storage and Storage Area Network Solution. PING conary.rpath.com (208.82.215.41) 56(84) bytes of data. If Internet access is available: Update the Openfiler installation by typing conary updateall and pressing Enter. Note: It will take quite a few minutes for the updates to be downloaded and applied. Resolving dependencies...Performing critical system updates, will then restart update. Login to Openfiler GUI –> Select the System tab –> Click System Update –> Finally click Launch system update. This post describes on how to setup and configure hosted Openfiler iSCSI storage target on a VMware ESX/ESXi or VMware server 1.x or 2.x host using the freely available Openfiler appliance. However this configuration and setting not a suitable solution for a production environment as it does not include any iSCSI CHAP authentication or datastore multipathing. But it’s good for troubleshooting and learning. Openfiler is an Open Source Network Attached Storage and Storage Area Network Solution. a. VMware ESX/ESXi/Server 2.0/Vmware workstations/VMware player as a host with a minimum of 5GB of free space on the local datastore. 1. Extract the contents of the downloaded Openfiler tar.gz file (one .vmx file and two .vmdk files) into a directory, the name of which reflects the hostname you wish to use for the Openfiler appliance (example: storage01). 2. Login to ESXi/ESX/VMware Server/Vmware Workstation console, add extracted Openfiler tar.gz file to inventory. 3. Skipped this step on VMware Server 1.x, VMware Server 2.x and VMware Workstation. In ESXi/ESX server edit the Openfiler appliance settings and add a second disk of the size determined. (example: 30GB). 4. Modify the vCPU and Memory setting to meet your requirement. 6. Logon to the console as root. By default, no root password is set so you will not be prompted. Set a root password by entering the command passwd, pressing Enter and following the prompts. Note: A password must be set in order to permit a remote root login from a SSH client. Changing password for user root. 7. Browse to https:/DHCP_IP_Address:446, or to the IP address if not using DNS, and ignore the certificate warning. Logon to the Openfiler web interface with the default administrator. Username openfiler and default Password password. Note: The default administrative port number is 446. 8. 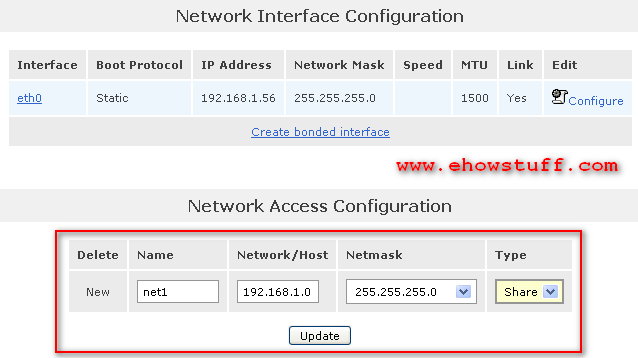 To Change to static IP, Select the System tab then scroll down to the “Network Interface Configuration” click “Configure“. On the Network Interface Configuration”, change default Boot Protocol, DHCP to Static for eth0. 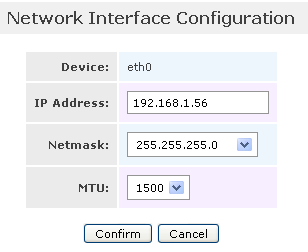 Then Enter the IP Address, Netmask and leave default for MTU. 9. To configure network range allowed, select the System tab and scroll down to the “Network Access Configuration” section. Define the allowed networks that accept connections from Openfiler appliance. You also can specify individual host IP addresses and ranges. Click Update after entering each set of details. 10. To add the the new logical disk select the Volumes tab and click the Block Devices link. Confirm the presence of disk /dev/sdb. Please note that the isk /dev/sda is the disk that Openfiler is running on; /dev/sdb is the second disk that was added and that will be provisioned as iSCSI storage. 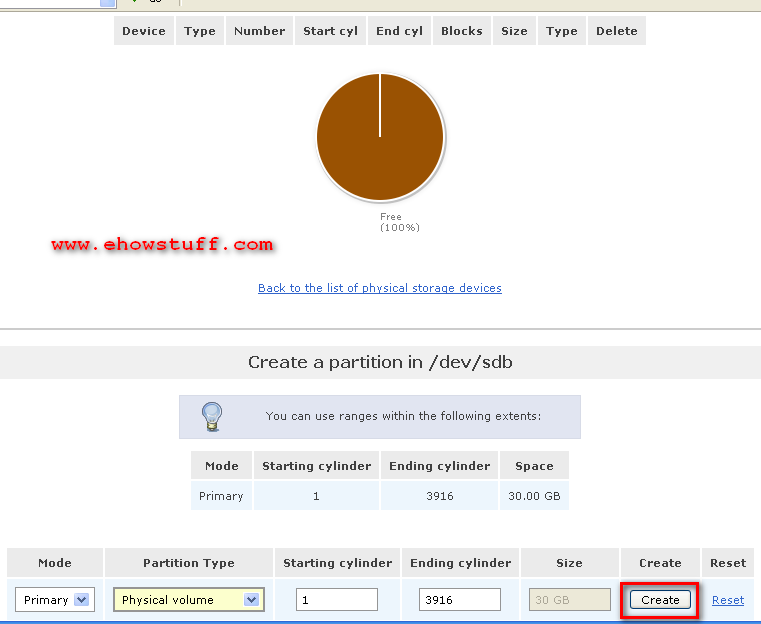 Click the /dev/sdb link and scroll down to the Create a partition in /dev/sdb section. By default, a partition will be created that fills the entire disk. Accept the defaults and click Create. 11. To add volume Group,select the Volumes tab. Click the Volume Groups link and enter a Volume Group name “datagroup” (the name is not critical), select /dev/sdb1 (30GB) and click Add volume group. 12. To Create a volume in “datagroup“, select the Volumes tab. Click the Add Volume link. The only existing volume group of volumegroup (datagroup) will be selected by default. Scroll down to the Create a volume in “volumegroup” section. Enter a Volume Name of volume (the name is not critical), a Volume Description of vmware (the description is not critical), adjust the required Space slider up to the maximum, select a Filesystem/Volume type of iSCSI and click Create. 13. This steps is to enable iSCSI target and disable iSCSI initiator. Select the Services tab. Click the Enable link adjacent to iSCSI target server. Click the Disable link adjacent to iSCSI initiator. 14. 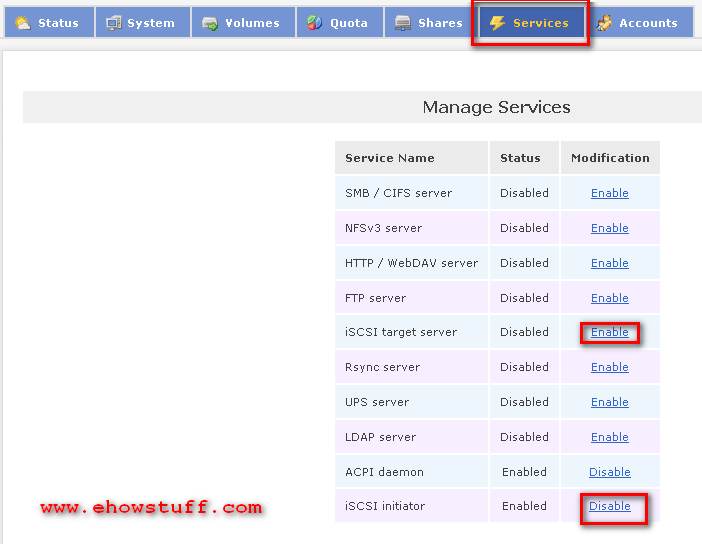 To Add new iSCSI target, select the Volumes tab and click the iSCSI Targets link from the Volumes Section menu. Modify the auto-generated Target IQN to include the Openfiler name (iqn.2012.openfilerlab1.local in this example) and click Add. Then select the LUN Mapping sub-tab and click Map to map the previous defined volume as a LUN to the newly created iSCSI target (accepting all the defaults). Finally, select the Network ACL sub-tab and change the Access from Deny to Allow. Click Update. 15. Congratulation!! Now the iSCSI target is accessible to any iSCSI requester on the permitted network/s or IP addresses. Reverse Domain Name System (DNS) lookup (also known as rDNS) is a process to determine the hostname associated with a given IP address. It is part of the behavior of the DNS. Its main function is to translate the numeric addresses(IP addresses)of the websites to domain or host names, as opposed to the Forward DNS process. Reverse DNS is separate from forward DNS. Many internet mail servers use reverse DNS to confirm that the server trying to deliver mail to them is genuine, this can help to reduce amount of spam that comes in to their network. Follow the following steps to check or test reverse DNS on linux and Windows operating system. 97.214.173.184.in-addr.arpa domain name pointer 184.173.214.97-static.reverse.softlayer.com. 1. Sign in to your Gmail account. 2. Click on the gear icon in the upper right, then select Settings. This will bring you to configuration screen. 3. Click Forwarding and POP/IMAP. 4. By default IMAP is not enabled. Select Enable IMAP. 5. Configure your IMAP client and click Save Changes. You can configure what is the next action when I mark a message in IMAP as deleted. You also can configure what is the next action when a message is marked as deleted and expunged from the last visible IMAP folder. 6. Follow the “Configuration instructions” to configure your mail client such as Mozilla Thunderbird, Android and iPhone. FastStone Image Viewer is a freware tool for image converter and editor. The current updated version for FastStone Image Viewer are 4.6. It’s very fast, stable, user-friendly image browser, converter and editor. It has a nice array of features that include image viewing, management, comparison, red-eye removal, emailing, resizing, cropping, retouching and color adjustments. Its innovative but intuitive full-screen mode provides quick access to EXIF information, thumbnail browser and major functionalities via hidden toolbars that pop up when your mouse touches the four edges of the screen. Other features include a high quality magnifier and a musical slideshow with 150+ transitional effects, as well as lossless JPEG transitions, drop shadow effects, image annotation, scanner support, histogram and much more. It supports all major graphic formats (BMP, JPEG, JPEG 2000, animated GIF, PNG, PCX, PSD, EPS, TIFF, WMF, ICO and TGA) and popular digital camera RAW formats (CRW, CR2, NEF, PEF, RAF, MRW, ORF, SRF, ARW, SR2, RW2 and DNG). 1. Convert all Format to MP4/3GP/MPG/AVI/WMV/FLV/SWF. 2. Convert all Format to MP3/WMA/AMR/OGG/AAC/WAV. 3. Convert all Format to JPG/BMP/PNG/TIF/ICO/GIF/TGA. 4. Convert Rip DVD to video file , Rip Music CD to audio file. 5. MP4 files support iPod/iPhone/PSP/BlackBerry format. 6. Supports RMVB,Watermark, AV Mux. 1.It support converting all popular video,audio,picture formats to others. 2 It can repair damaged video and audio file. 3 It can reduce Multimedia file size. 4 It support iphone,ipod multimedia file formats. 5 Picture converting supports Zoom,Rotate/Flip,tags. In this i will show the quick steps how to verify MD5 using MD5sums on Windows 7. This steps may working on other Windows operating system such as Windows 2000, Windows XP, Windows 2003 server and Windows 2008 server. MD5sums calculates the MD5 message digest for one or more files. MD5 is a message digest algorithm that takes a message of arbitrary length and produces a 128-bits digital signature of the message. 5. If the MD5 key is the same above, the downloaded iso should be ok. When you lodged a support request to VMware Technical Support, they routinely requests the diagnostic information from you. This diagnostic information contains product specific logs and configuration files from the host on which the product is run or from the host that may have issues and need further troubleshooting. This information is gathered using a specific script or tool within the product. Collecting diagnostic information is the same as collecting or gathering log files. This post will provides procedures for obtaining diagnostic information for ESXi 5.0. 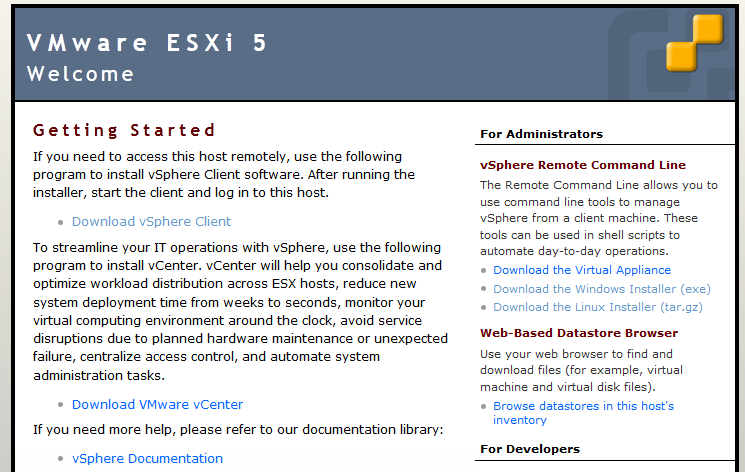 ESXi 5.0 host diagnostic information can be gathered using the vSphere Client connected to the ESXi host or to vCenter Server. 1. 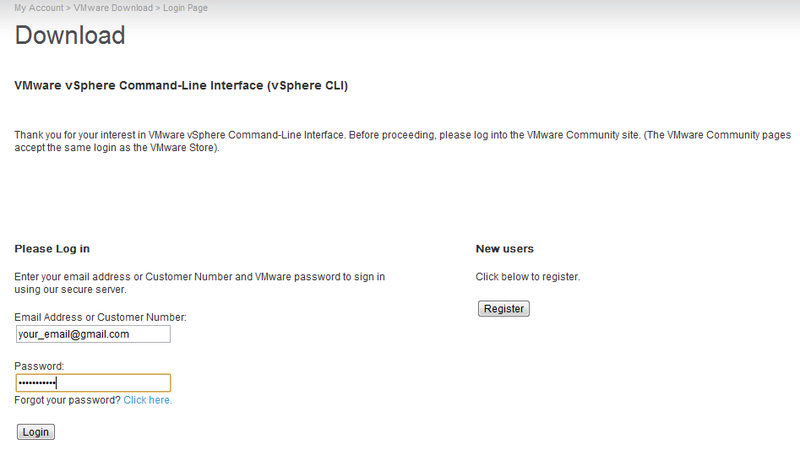 Open the vSphere Client and connect to vCenter Server or directly to an ESXi 5.0 host. 2. Log in using an account with administrative privileges or with the Global.Diagnostics permission. 3. Select an ESXi host, cluster, or datacenter in the inventory. 4. Click the File > Export > Export System Logs. 5. If a group of ESXi hosts are available in the selected context, select the host or group of hosts from the Source list. 7. In the System Logs pane, select the components for which the diagnostic information must be obtained. To collect diagnostic information for all the components, click Select All. 8. If required, select the Gather performance data option and specify a duration and interval. 10. In the Download Location pane, click Browse and select a location on the client’s disk where you want to to save the support bundle. 12. In the Ready to Complete pane, review the summary and click Finish. The Downloading System Logs Bundles dialog appears and provides progress status for the creation and downloading of the support bundle from each source. A Generate system logs bundles task is created. 13. When complete, upload the logs to the FTP site. For more information, see Uploading diagnostic information to VMware (1008525). The vSphere Command-Line Interface (vSphere CLI) command set allows you to run common system administration commands against ESX/ESXi systems from any machine with network access to those systems. vSphere CLI provides a set of commands that you use to manage, configure, and automate administrative activities for ESXi and your vSphere virtual environment. It’s includes the ESXCLI command set, vicfg- commands, and some other commands. 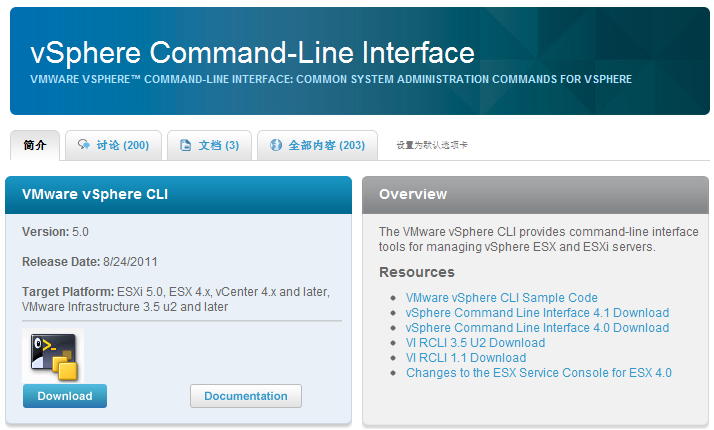 This are the current version of the vSphere CLI at the time this post is written. It is recommended to install VMware Tools in the guest operating system. Although the guest operating system can run without VMware Tools, you lose important functionality, convenience and performance improvement. 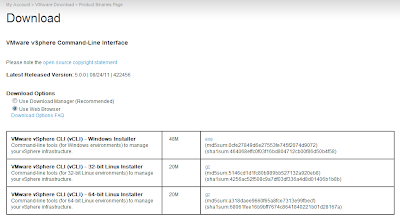 a) The VMware Tools service (vmtoolsd.exe on Windows guests or vmtoolsd on Linux and Solaris guests). This service synchronizes the time in the guest operating system with the time in the host operating system. On Windows guests, it also controls grabbing and releasing the mouse cursor. b) A set of VMware device drivers, including an SVGA display driver, the vmxnet networking driver for some guest operating systems, the BusLogic SCSI driver for some guest operating systems, the memory control driver for efficient memory allocation between virtual machines, the sync driver to quiesce I/O for Consolidated Backup, and the VMware mouse driver. c) The VMware Tools control panel, which lets you modify settings, shrink virtual disks, and connect and disconnect virtual devices. d) You can also use the command-line interface of the VMware Tools configuration utility in the guest operating system to perform these tasks. See the VMware Tools Configuration Utility User’s Guide. e) A set of scripts that helps you to automate guest operating system operations. The scripts run when the virtual machine’s power state changes if you configure them to do so. f) The VMware user process (VMwareUser.exe on Windows guests or vmware-user on Linux and Solaris guests), which enables you to copy and paste text between the guest and managed host operating systems. 1. Ensure that your Solaris virtual machine is powered on. In the vSphere Client inventory, right-click the virtual machine and select Power > Power On. 2. Click VM in the virtual machine menu, then click Guest > Install/Upgrade VMware Tools and click OK.
3. Copy vmware-solaris-tools.tar.gz from /cdrom/vmwaretools to a temporary directory (/tmp/). 4. Decompress the file using gunzip command. Important Note :It is recommended to respond to the configuration questions and press “Enter” to accept all of the default values. Reboot the virtual machine for changes to take effect. On February 17, 2012, Microsoft Sysinternals has released a new version of its excellent system monitoring tool which is Process Explorer 15.13. Process Explorer is an advanced process management utility that picks up where Task Manager leaves off. It will show you detailed information about a process including its icon, command-line, full image path, memory statistics, user account, security attributes, and more. Process Explorer can shows you the information about which handles and DLLs processes have opened or loaded. The Process Explorer display consists of two sub-windows. The top window always shows a list of the currently active processes, including the names of their owning accounts, whereas the information displayed in the bottom window depends on the mode that Process Explorer is in: if it is in handle mode you’ll see the handles that the process selected in the top window has opened; if Process Explorer is in DLL mode you’ll see the DLLs and memory-mapped files that the process has loaded. Process Explorer also has a powerful search capability that will quickly show you which processes have particular handles opened or DLLs loaded. The unique capabilities of Process Explorer make it useful for tracking down DLL-version problems or handle leaks, and provide insight into the way Windows and applications work. 2. After downloaded the file, extract it and open ProcessExplorer folder. Double click procexp. nslookup is a command-line tool for network administrator and system administrator that available in many computer operating systems such as linux and windows for querying the Domain Name System (DNS). 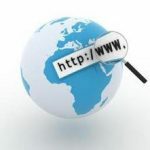 nslookup can obtain domain name or IP address or for any other specific DNS record. In this post, i will share how nslookup command will useful to check MX record on windows command prompt. After entering “set typ=mx” or “set q=mx”, you can proceed to enter the domain name that you want to check it’s mx records. In this example, i will share the mx records for gmail.com, yahoo.com and bloggermy.com.